From what I can tell, the original FOBO system was also a startup thru Indiegogo - this is a new version, and the sensors appear to be a bit smaller than the prior versions. For those that have been considering TPMS, or needing an upgrade to what you have now, this might be the poor man's way of getting in on this. Yep, just put my name on this - and they have another few weeks to go. I'm considering it a holiday gift...delivery in December. I got FOBO's about two years ago. Love'em!! Edited to add: don't forget to use them on metal stems. I got metal T-stems so I don't have to remove the FOBO to add air. I'll add the T stems on the next tire change, but I sure like the idea of not needing to check the air each time I want to ride. It was cheaper than trying to fix the TPMS that came on my 2012, and I can put my spare wheel on, and still have monitoring. Thinking about getting a set for the car just so I can know if the pressure is low. Update...fully funded in one week. There is still time to get in on these at this low amount if interested. I ordered a set; probably about time to replace mine. The older set can fall back to working on my trailer. "We would love to let more bikers to enjoy the many benefits of the product and so we are glad to inform that we would extend the deadline of the campaign for 19 more days." So, you can still get in on this! Update - mine arrived today! Setup in about ten minutes - valve stems included! Then, it might be time for a short ride. unclejohn Thanks for passing the info along on this! Both are about one PSI lower than the gauge pressure, but don't know if that's a kPa/psi conversion error or not. I have them on two bikes. I love them. Note to self. Make sure you remove them before having a dealer replace a tire. The t-stems will go on each tire as they get replaced as well. Makes it easy to know if you need to add air without crawling under the bike, etc. I got both T-stems and straight stems with the kit...and the rims on the bike right now are 90 degree metal stems. Mine are due on Monday. After a high velocity flogging yesterday - about three hours with air temperatures ranging from low 50's to the 70° it was when I pulled into the garage. It'll be interesting to get a good handle of tire temps, especially when it's about 20° or 30° hotter than it was on Tuesday. I have been using FoBo for nine years now same original equipment works great good customer service very easy maintenance just change your battery once a Year and your good to go. What the heck is FoBo? FOBO is an add-on TPMS that links with your smartphone. It's a really good TPMS; especially for the price. Now they've come out with the FOBO2. I've had FOBOs on my bike for some time and bought the FOBO2 when they were being announced. In the process of adding in the updated FOBO2 app to my iPhone, I found it connected automatically with my existing FOBOs and actually read them better than the old app. So, instead of updating to the new FOBO2 devices, I'm going to hold them in abeyance until my old set need new batteries....then I'll make the effort of adding metal valve stems to my bike trailer tires and transfer them to the trailer. Plus 1 on the t-valves! After a tire swap, the sensors and T-valves are on the bike. I found *both* of my digital tire gauges; problem is, they only read down to 0.5 lb increments. The Fobo 2 sensors are still reading roughly 1 PSI low (compared to those two digital tire gauges which agree with each other). I don't see where my digital tire gauges switch to either bar or kpa (e.g. metric) measurements. I'm still thinking there is a slight error in the conversion to PSI from kpa. No one has mentioned the accuracy/usefulness of the Wing's own TPMS. Why would I need these (As loved by all of you as they are) if I have the on board TPMS? I like the Bluetooth feature set, but not sold that this is worth 100 bucks. Sell me. There are a lot of choices in tire pressure monitoring systems. I have tried a couple myself, with mixed results. 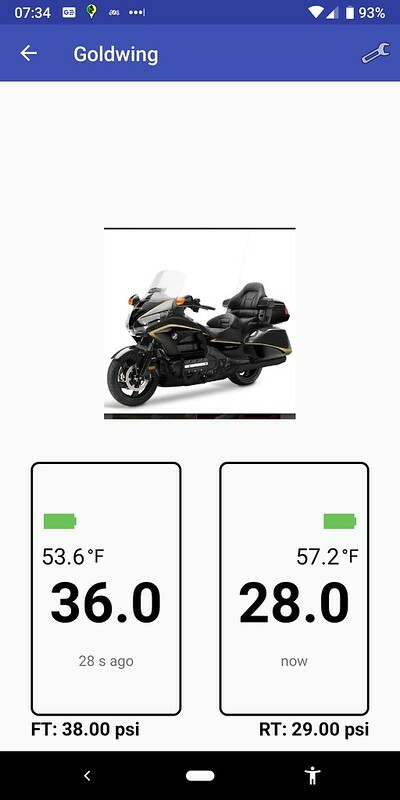 And quite frankly, if Honda had a decent TPMS built into the Goldwing, an aftermarket one would not be necessary. However, the Goldwing TPMS is inadequate, not displaying the actual pressure of each tire. As a result, many Goldwing (and other motorcycle) riders opt for an aftermarket solution.